The Economics B.A. teaches the toolkit of economists (i.e., how individuals, firms and governments make choices) and applies those tools to understanding contemporary issues including policy decisions for firms and governments. In objectives it is much like Economics programs taught in many universities; what's unique about the UCSD version is the emphasis on rigorous microeconomics and econometrics. Our Management Science B.S. is a unique program designed for students with an interest in business analytics. It teaches the basic economics toolkit, applied to the challenges of management in private and public sectors. In objectives it is most like a Business Administration major, but what sets it apart is our emphasis on mathematical and quantitative tools. In contrast to the B.A., it requires finance, operations research and decisionmaking under uncertainty, but less macroeconomics. Our Math-Econ B.S. is a program designed for students who aspire to graduate study in economics or business. It teaches the same basic toolkit of economists, but delves deeper into the underlying mathematical foundations of microeconomics and econometrics. Compared to the B.A., it requires more (you guessed it..) math, mostly calculus. Effective FA17: All students must have a minimum 2.0 major GPA in order to graduate. All three majors offer honors programs, and a wealth of choices among our electives. Our students often pursue minors in other programs. 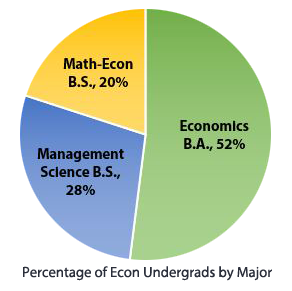 Popular choices are Accounting, Business, Computer Science, and Political Science. Questions about the student experience? Connect with a current student in our Undergraduate Economic Society (UES) at ues.ucsd.edu, or on Facebook.